Human salivary alpha amylase (HSAmy) is an important enzyme found in the oral cavity. It belongs to the glycoside hydrolase family and exists in various isoforms in salivary secretions. Humans produce two kinds of alpha amylase (salivary and pancreatic amylase) that overall share about 97% homology. HSAmy is a type of hydrolase that breaks down complex carbohydrates into simple sugars, like glucose or maltose, by cleaving alpha-1,4-glucosidic bonds. 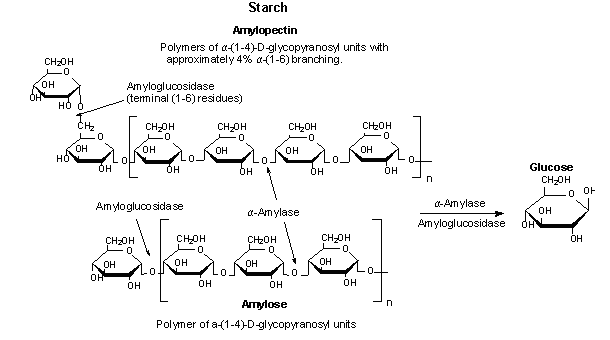 Further breakdown of the starch is completed by pancreatic amylase later in digestion. This enzyme has distinct components including a calcium ion, chloride ion, and various amino acid residues that play critical roles in hydrolytic activity and substrate binding. HSAmy can also bind to oral streptococci bacteria. This results in the bacteria either being removed from or stored in the oral cavity. Storage and accumulation of the bacteria in the oral cavity causes dental complications like plaque and tooth decay. The structure of HSAmy consists of a single polypeptide chain of 496 amino acids that can be divided into three domains. houses the active site and contains three catalytic residues: Asp197, Glu233, and Asp300. The neon structures are GLC sugars used for crystallography purposes and demonstrate the binding region. Hydrophobic ligands Arg337, Arg195 and Asn298 function as binding sites for chloride ions, which are required for full catalytic activity. These binding sites also contain hydrophobic residues ( Phe265 and Phe295) nearby that aid in the catalytic activity of the enzyme. Only one chloride ion and calcium ion bind per molecule of HSAmy. consists of one calcium binding site. HSAmy is a calcium metalloenzyme and therefore cannot function efficiently in the absence of calcium. The ion serves as a stabilizer during hydrolytic activity and is held in place by residues Arg158, Asn100, Asp167, and His201. is arranged in a Beta-structure and its function is still unknown. The is an important feature of human salivary alpha amylase. The loop is glycine-rich, malleable, and holds the substrate in place during activity. It also plays a role in the release of product. The loop is in the "open" conformation when substrate is unbound, and is in the "off" position when a substrate is attached. The loop becomes more flexible and "opens" when it is time for the products to be released. Then the cycle restarts. When a carbohydrate binds to the active site (located in Domain A), the flexible loop becomes more structured and as a result moves into contact with the substrate. His201 first detects the the substrate and causes the loop to take action. After the loop binds to the substrate, several residues play important roles. Ala307 and Gly306 protect the substrate with a hydrophobic cover, while residues Trp203 and Trp 284 (located on the secondary binding site) assist in hydrolytic activity. Trp59 and Tyr62 are involved in stacking to bind glucose and guide it to the catalytic residues. Several residues in Domain A assist in the binding and hydrolytic activity to substrates. Trp58 is critical for substrate binding, while Trp59 and Tyr62 are involved in stacking to bind glucose and guide it to the catalytic residues. His299 and His101 are necessary for catalysis. Between fluctuations in pH, temperature, nutrient supply, and saliva flow, the oral cavity is a challenging location for bacteria to persist. Human salivary alpha-amylase binds to oral streptococci in a similar fashion as it does to complex carbohydrates. When breaking down bacteria, His201 and His305 are necessary to detect bacterial and starch substrates, while the flexible loop attaches and changes conformation, holding the substrate in place. Trp58 is vital for optimal hydrolytic activity. It detects substrates and is thought to assist in the orientation of the substrate, as well as assist His305 to its correct position. 1. Ramasubbu, Narayanan, Chandran Ragunath, Prasunkumar J. Mishra, Leonard M. Thomas, Gyo¨ Ngyi Gye´ma´nt, and Lili Kandra. "Human Salivary A-amylase Trp58 Situated at Subsite ) 2 Is Criticalfor Enzyme Activity." Wiley Online Library. FEBS, 4 June 2004. Web. 02 Dec. 2015. 2. Hsiu, Julia, Edmond H. Fischer, and Eric A. Stein. "Alpha-Amylases as Calcium-Metalloenzymes. II. Calcium and the Catalytic Activity." Biochemistry including Biophysical Chemistry & Molecular Biology. ACS Publications, n.d. Web. 02 Dec. 2015. 3. Ramasubbu, Narayanan, Chandran Ragunath, Krishnan Sundar, Prasunkumar J. Mishra, Gy¨ongyi Gyémánt, and Lili Kandra. "Structure-function Relationships in Human Salivary alpha-amylase: Role of Aromatic Residues." Academia. Academia, 2005. Web. 02 Dec. 2015. 4.Lebenthal, E. (1987). Role of salivary amylase in gastric and intestinal digestion of starch. Digestive Diseases and Sciences, 32 (10), 1155-1157. 5. Butterworth, Peter J., Frederick J. Warren, and Peter R. Ellis. "Human Alpha-amylase and Starch Digestion: An Interesting Marriage." Wiley Online Library, 5 Jan. 2011. Web. 02 Dec. 2015. 6. Nishide, T., Nakamura, Y., Emi, M., Yamamoto, T., Ogawa, M., Mori, T., Matsubara, K. (1986). Primary structure of human salivary alpha amylase gene. Gene, 41(2-3), 299-304. 7. "3BLK." RCSB PDB. PDB-101, Worldwide PDB Protein Data Bank, EMDataBank, Ndb, Structural Biology Knowledgebase, n.d. Web. 02 Dec. 2015. 8. Ragunath, Chandran, Suba G.A. Manuel, Venkat Venkataraman, Hameetha B.R. Sait, Chinnasamy Kasinathan, and Narayanan Ramasubbu. "Probing the Role of Aromatic Residues at the Secondary Saccharide Binding Sites of Human Salivary alpha-amylase in Substrate Hydrolysis and Bacterial Binding." Probing the Role of Aromatic Residues at the Secondary Saccharide Binding Sites of Human Salivary alpha-amylase in Substrate Hydrolysis and Bacterial Binding 384.5 (2008): 1232-248. Journal of Molecular Biology. U.S. National Library of Medicine, 14 Oct. 2008. Web. 02 Dec. 2015.